Hope you guys had a wonderful and marry Christmas. Today, I as usual, I want to share with another no bake easy to make treat, with vegan, gluten free and healthy as well. I came across this wonderful treat at Chocolate-covered Katie blog site. Happy readings. Add dates in a bowl with warm water and allow them to soak for 30 minutes, then drain. Mix together dates, almonds, walnuts, and 1/4 cup cocoa powder in a food processor until well blended. Spread mixture in a 9×5 baking pan (or an 8×8 is okay) until evenly distributed, and press down gently with a spoon. Mix together bananas, almond butter, honey, and other 1/4 cup cocoa powder in the food processor until well blended. Spread mixture over bottom layer until evenly distributed. Place in freezer for 30 minutes. Re-freeze whatever you don’t eat, and enjoy at another time! 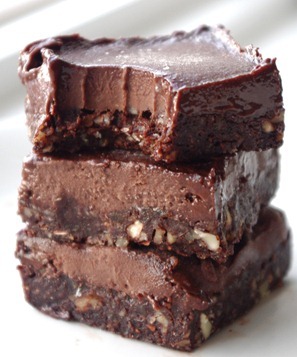 Hope you enjoy this sweet, healthy, vegan, gluten free, and tasty no bake treat. Enjoy. This entry was posted in Gluten Free, Recipes, Vegan and tagged Gluten Free, Healthy Treat, No Bake Treat, Vegan by allaboutme31. Bookmark the permalink.